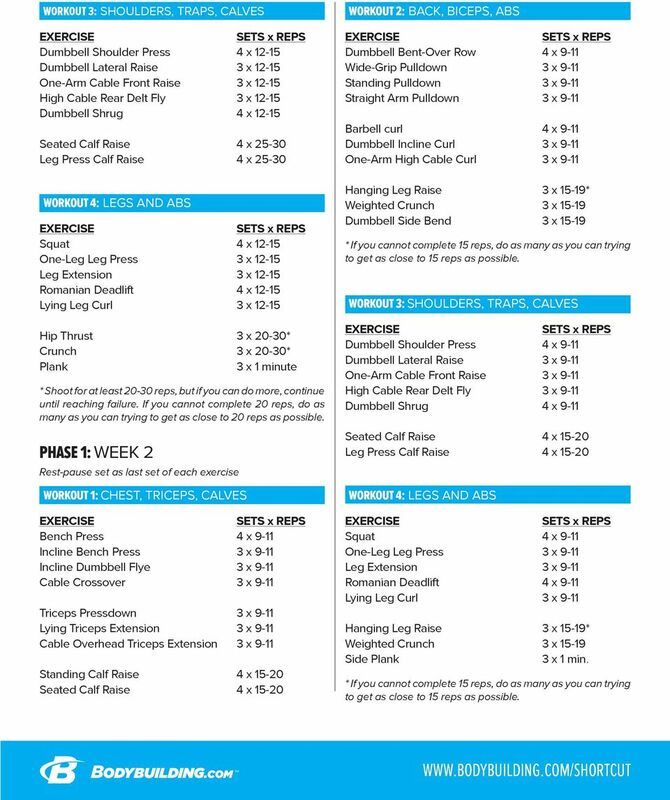 3 linear group started each phase with 4-6 reps and ended with They measured their muscle mass, body fat and strength on bench presses, lat pulldowns, barbell curls, and leg extensions before and after the 12 weeks. They reported that the linear group gained 7 pounds of lean muscle mass while the reverse group only gained 3 pounds of muscle. The linear group also lost over 5 pounds of body fat while the reverse group lost a little over 3 pounds of body fat. Although both groups increased strength on all exercises, the linear group made greater gains than the reverse group. The first exercise you do for each muscle group (except for abs and calves) will remain constant throughout all 12 weeks. This is the exercise that you are focusing on increasing your strength on. Most of the assistance exercises that follow the first exercise will change every phase. 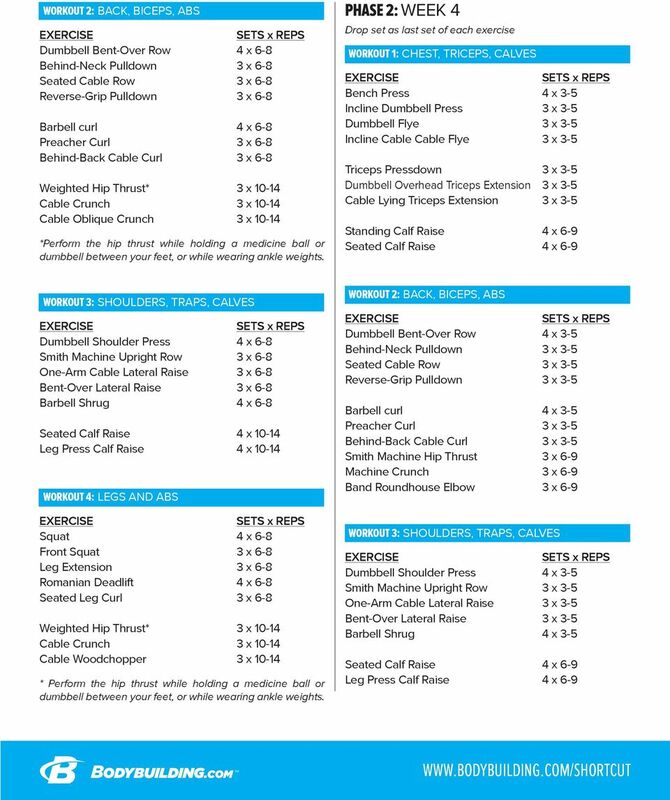 For abs, the exercises will change each week based on the rep ranges. This is due to the fact that some ab exercises are easier to do for higher reps, while some are difficult to do for lower reps. 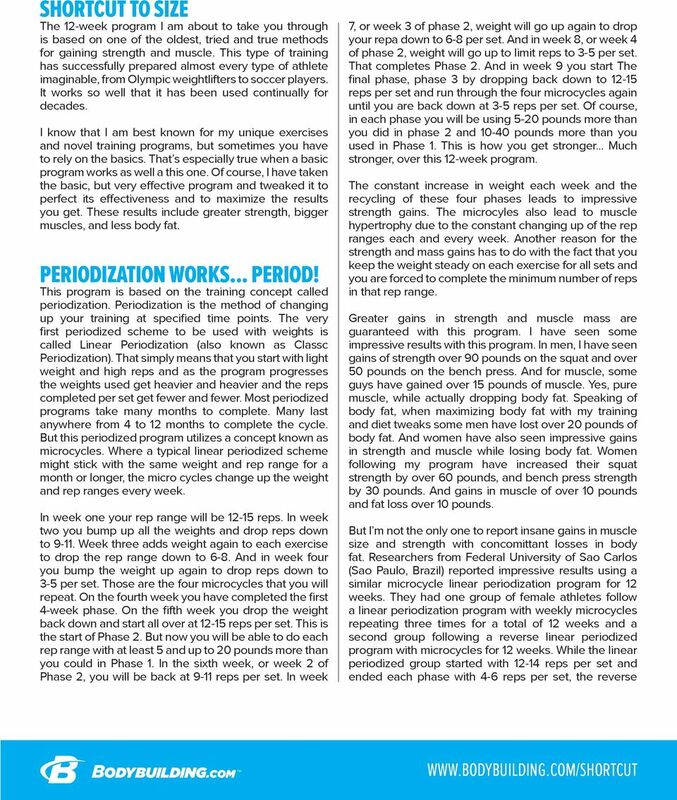 So I organized the best ab exercises for the prescribed rep ranges. 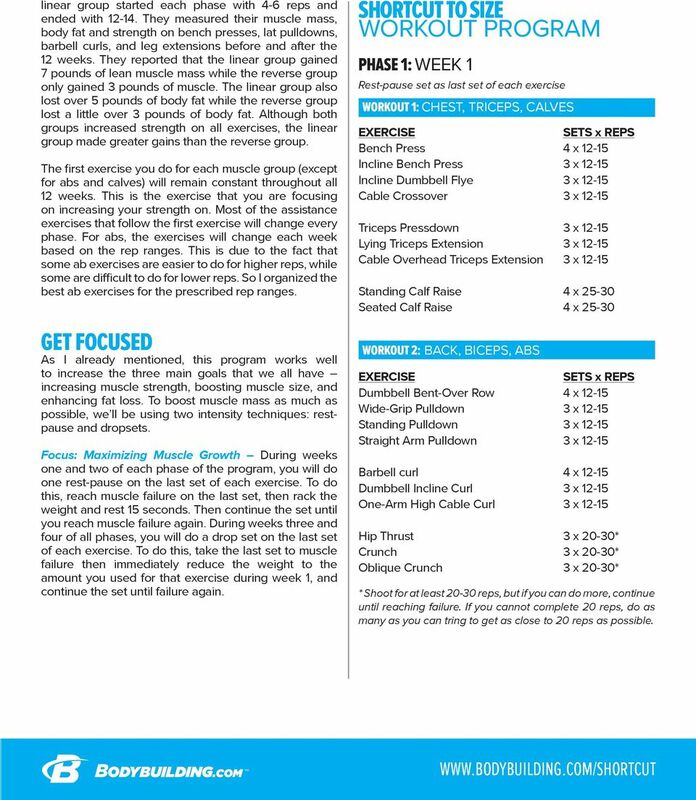 GET FOCUSED As I already mentioned, this program works well to increase the three main goals that we all have increasing muscle strength, boosting muscle size, and enhancing fat loss. 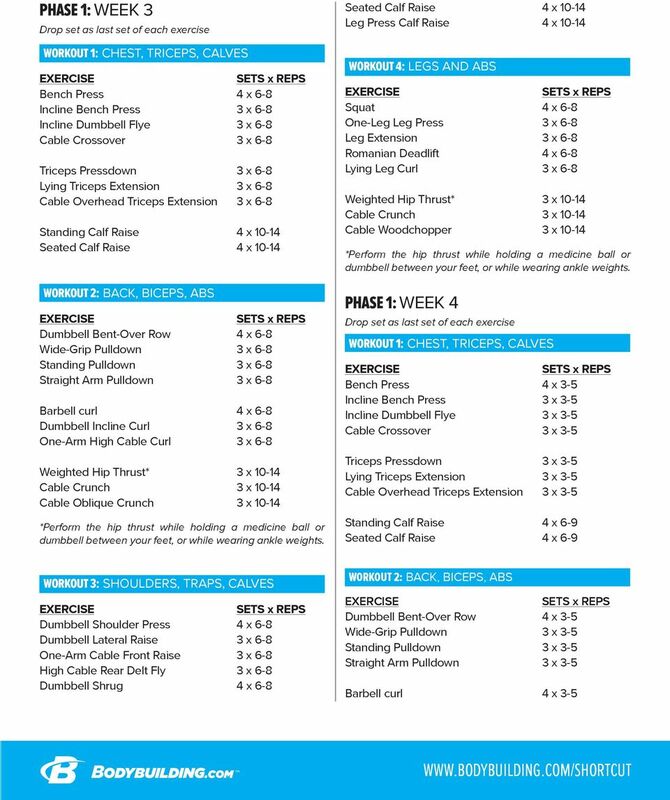 To boost muscle mass as much as possible, we ll be using two intensity techniques: restpause and dropsets. 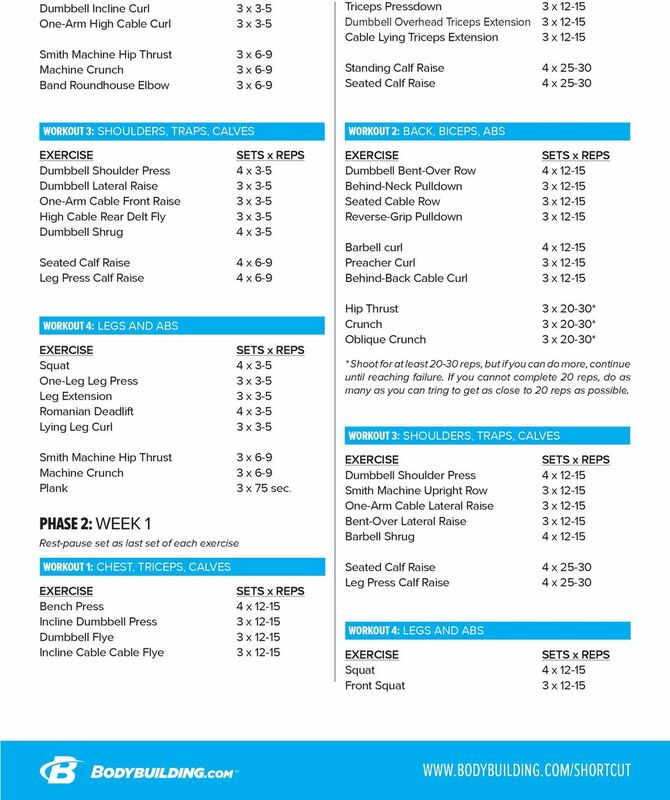 Focus: Maximizing Muscle Growth During weeks one and two of each phase of the program, you will do one rest-pause on the last set of each exercise. To do this, reach muscle failure on the last set, then rack the weight and rest 15 seconds. Then continue the set until you reach muscle failure again. 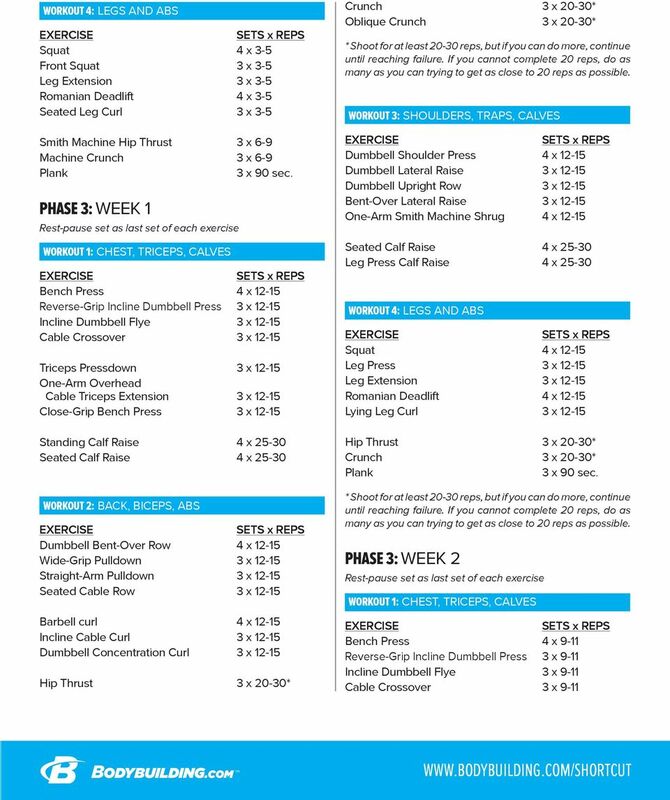 During weeks three and four of all phases, you will do a drop set on the last set of each exercise. To do this, take the last set to muscle failure then immediately reduce the weight to the amount you used for that exercise during week 1, and continue the set until failure again. 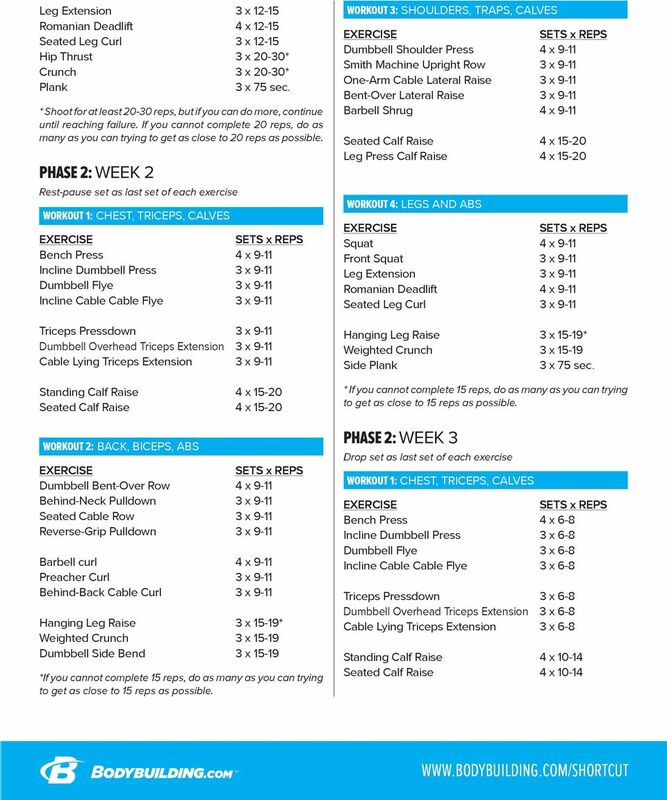 SHORTCUT TO SIZE WORKOUT PROGRAM PHASE 1: WEEK 1 Rest-pause set as last set of each exercise Bench Press 4 x Incline Bench Press 3 x Incline Dumbbell Flye 3 x Cable Crossover 3 x Triceps Pressdown 3 x Lying Triceps Extension 3 x Cable Overhead Triceps Extension 3 x Standing Calf Raise 4 x Seated Calf Raise 4 x Dumbbell Bent-Over Row 4 x Wide-Grip Pulldown 3 x Standing Pulldown 3 x Straight Arm Pulldown 3 x Barbell curl 4 x Dumbbell Incline Curl 3 x One-Arm High Cable Curl 3 x Hip Thrust 3 x 20-30* Crunch 3 x 20-30* Oblique Crunch 3 x 20-30* * Shoot for at least reps, but if you can do more, continue until reaching failure. If you cannot complete 20 reps, do as many as you can tring to get as close to 20 reps as possible. 4 Dumbbell Shoulder Press 4 x Dumbbell Lateral Raise 3 x One-Arm Cable Front Raise 3 x High Cable Rear Delt Fly 3 x Dumbbell Shrug 4 x Seated Calf Raise 4 x Leg Press Calf Raise 4 x Squat 4 x One-Leg Leg Press 3 x Leg Extension 3 x Romanian Deadlift 4 x Lying Leg Curl 3 x Hip Thrust 3 x 20-30* Crunch 3 x 20-30* Plank 3 x 1 minute * Shoot for at least reps, but if you can do more, continue until reaching failure. If you cannot complete 20 reps, do as many as you can trying to get as close to 20 reps as possible. PHASE 1: WEEK 2 Rest-pause set as last set of each exercise Bench Press 4 x 9-11 Incline Bench Press 3 x 9-11 Incline Dumbbell Flye 3 x 9-11 Cable Crossover 3 x 9-11 Triceps Pressdown 3 x 9-11 Lying Triceps Extension 3 x 9-11 Cable Overhead Triceps Extension 3 x 9-11 Standing Calf Raise 4 x Seated Calf Raise 4 x Dumbbell Bent-Over Row 4 x 9-11 Wide-Grip Pulldown 3 x 9-11 Standing Pulldown 3 x 9-11 Straight Arm Pulldown 3 x 9-11 Barbell curl 4 x 9-11 Dumbbell Incline Curl 3 x 9-11 One-Arm High Cable Curl 3 x 9-11 Hanging Leg Raise 3 x 15-19* Weighted Crunch 3 x Dumbbell Side Bend 3 x * If you cannot complete 15 reps, do as many as you can trying to get as close to 15 reps as possible. 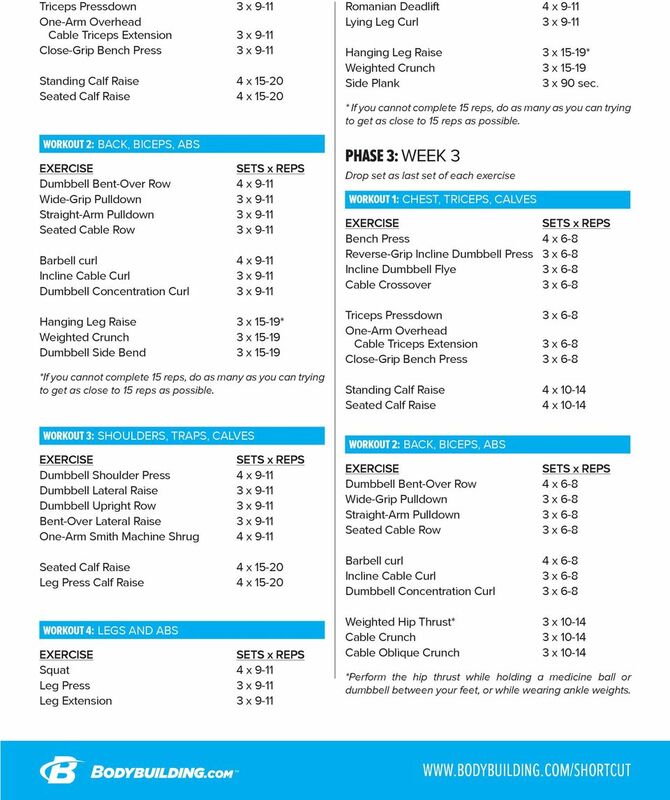 Dumbbell Shoulder Press 4 x 9-11 Dumbbell Lateral Raise 3 x 9-11 One-Arm Cable Front Raise 3 x 9-11 High Cable Rear Delt Fly 3 x 9-11 Dumbbell Shrug 4 x 9-11 Seated Calf Raise 4 x Leg Press Calf Raise 4 x Squat 4 x 9-11 One-Leg Leg Press 3 x 9-11 Leg Extension 3 x 9-11 Romanian Deadlift 4 x 9-11 Lying Leg Curl 3 x 9-11 Hanging Leg Raise 3 x 15-19* Weighted Crunch 3 x Side Plank 3 x 1 min. * If you cannot complete 15 reps, do as many as you can trying to get as close to 15 reps as possible. 10 Triceps Pressdown 3 x 9-11 One-Arm Overhead Cable Triceps Extension 3 x 9-11 Close-Grip Bench Press 3 x 9-11 Standing Calf Raise 4 x Seated Calf Raise 4 x Dumbbell Bent-Over Row 4 x 9-11 Wide-Grip Pulldown 3 x 9-11 Straight-Arm Pulldown 3 x 9-11 Seated Cable Row 3 x 9-11 Barbell curl 4 x 9-11 Incline Cable Curl 3 x 9-11 Dumbbell Concentration Curl 3 x 9-11 Hanging Leg Raise 3 x 15-19* Weighted Crunch 3 x Dumbbell Side Bend 3 x *If you cannot complete 15 reps, do as many as you can trying to get as close to 15 reps as possible. Dumbbell Shoulder Press 4 x 9-11 Dumbbell Lateral Raise 3 x 9-11 Dumbbell Upright Row 3 x 9-11 Bent-Over Lateral Raise 3 x 9-11 One-Arm Smith Machine Shrug 4 x 9-11 Seated Calf Raise 4 x Leg Press Calf Raise 4 x Squat 4 x 9-11 Leg Press 3 x 9-11 Leg Extension 3 x 9-11 Romanian Deadlift 4 x 9-11 Lying Leg Curl 3 x 9-11 Hanging Leg Raise 3 x 15-19* Weighted Crunch 3 x Side Plank 3 x 90 sec. * If you cannot complete 15 reps, do as many as you can trying to get as close to 15 reps as possible. PHASE 3: WEEK 3 Drop set as last set of each exercise Bench Press 4 x 6-8 Reverse-Grip Incline Dumbbell Press 3 x 6-8 Incline Dumbbell Flye 3 x 6-8 Cable Crossover 3 x 6-8 Triceps Pressdown 3 x 6-8 One-Arm Overhead Cable Triceps Extension 3 x 6-8 Close-Grip Bench Press 3 x 6-8 Standing Calf Raise 4 x Seated Calf Raise 4 x Dumbbell Bent-Over Row 4 x 6-8 Wide-Grip Pulldown 3 x 6-8 Straight-Arm Pulldown 3 x 6-8 Seated Cable Row 3 x 6-8 Barbell curl 4 x 6-8 Incline Cable Curl 3 x 6-8 Dumbbell Concentration Curl 3 x 6-8 Weighted Hip Thrust* 3 x Cable Crunch 3 x Cable Oblique Crunch 3 x *Perform the hip thrust while holding a medicine ball or dumbbell between your feet, or while wearing ankle weights. 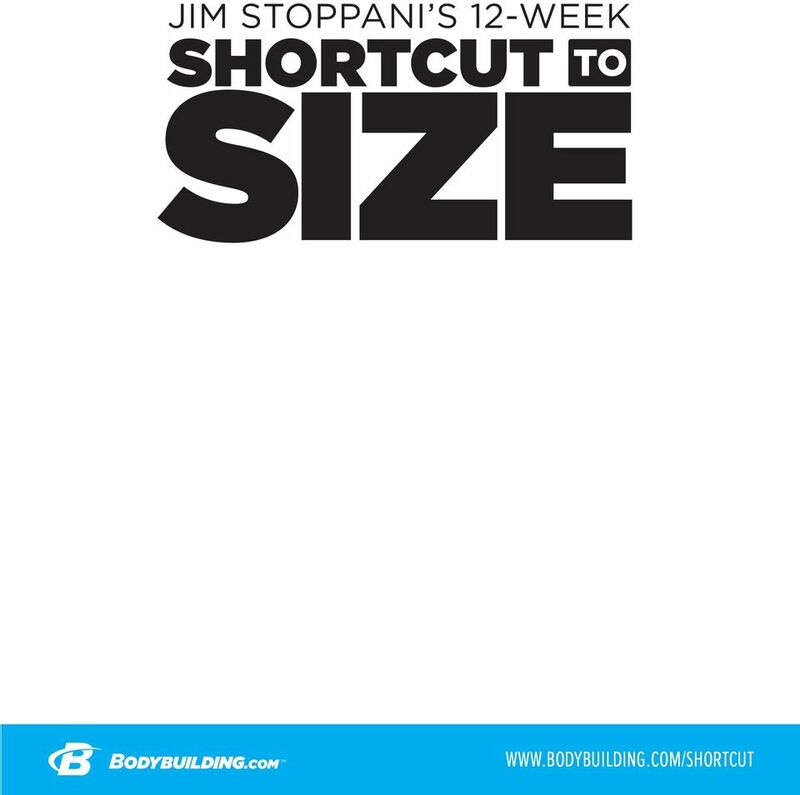 12 SHORTCUT TO SIZE NUTRITION Of course, as you well know by now, no training program is complete without a nutrition and supplement program to work with it. Training is just half the equation and nutrition is equally, if not more important for realizing your goals. But just as you can alter your training to focus more on a specific goal, you also need to alter your diet to better reach that goal. This diet is built for those who want to maximize muscle growth and strength gains. GAIN SIZE AND STRENGTH As you know the three main macronutrients are: 1) Protein, 2) Carbs and 3) Fat. 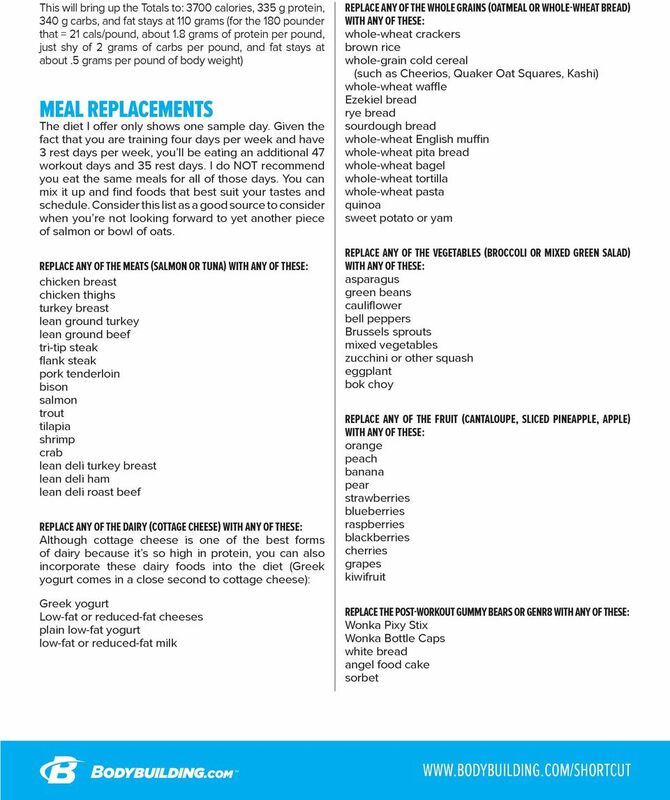 As you ve heard me state time and time again, protein is critical for building muscle size and strength. So it should come at no surprise that this diet will provide you ample amounts of protein to pack on muscle and get you stronger and more powerful. The basic diet plan, which is meant for rest days, or days you are not training, will provide you about 1.5 grams of protein. This will keep you anabolic and encourage muscle growth. 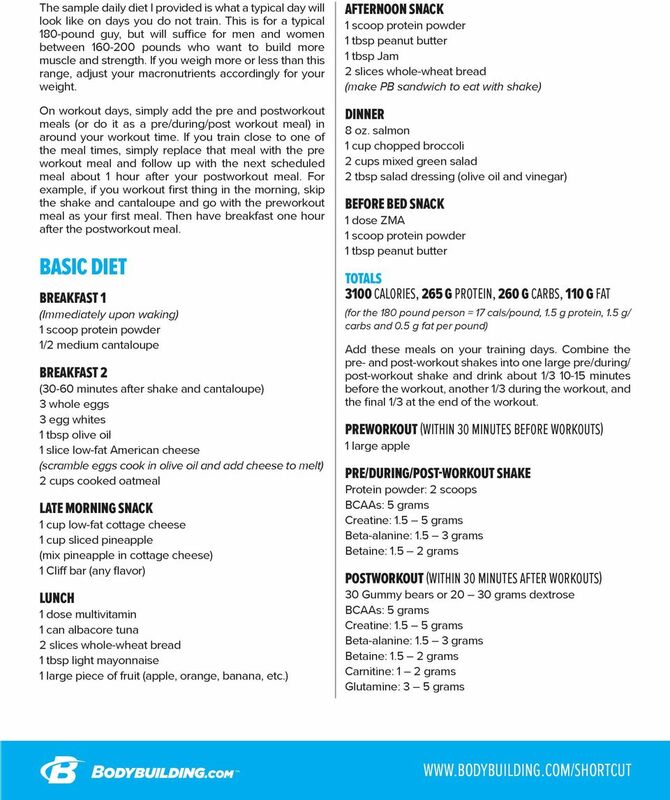 On Workout days the addition of a pre and postworkout shake or my favorite, a pre/during/postworkout shake, will bring your total daily protein intake closer to 2 grams per pound, which will be the days that extra protein will ensure that you re really kicking up muscle growth on those training days. Carbs are the macronutrient we like to give the most credit to when it comes to providing us energy, especially when we work out. Yet, while carbs are critical for workout energy, so is protein and fat. Yes, amino acids from the protein you eat can be used for energy and so can fat. I ll get into this in just a minute. Back to carbs to ensure you have ample levels of energy to get through these workouts and recover properly from them, you will be getting in about 1.5 grams of carbs per pound of body weight on rest days, and a full 2 grams of carbs per pound on workout days. To provide yourself the type of longlasting energy that will get you through these grueling workouts, without adding body fat, you should focus mainly on slow-digesting carbs. Research studies confirm that when athletes consume slow-digesting carbs (such as fruit and whole grains) earlier in the day, such as at breakfast and lunch, they have more energy for workouts and can workout harder for longer, in addition they burn more fat during exercise and at rest sitting around. That is why this diet focuses on fruits, oatmeal, and whole-wheat bread. These carbs will keep insulin levels low, which means you have more stable and longer-lasting energy, and you will burn more fat. Of course, there is a time or two when you want to focus on fast-digesting carbs. The first time is right when you wake up. Getting in fast carbs at this time will send those carbs straight to your liver, which will tell your body to stop burning up muscle protein for fuel. Yes, the bad news is that when you sleep, you go so long without eating that your body feeds on your muscle for fuel. But getting in fast carbs like cantaloupe (one of the few fast fruits, along with watermelon) will stop it quickly. Even other fruits that are low-glycemic or slow-digesting, such as apples, berries, oranges, etc make a good carb choice when you wake. One of the main reasons that fruit is low glycemic is the fructose content. Fructose has to go to the liver first to be converted to glucose (blood sugar). That is one of the main reasons why most fruits are slow. But the fructose still gets to your liver fairly quickly and signals your liver to stop burning muscle for fuel. Of course, with these carbs you ll need to add a fast-acting protein, like Pro Jym, to stop the breakdown of muscle protein and replace some of the lost aminos. This also happens to be the reason why you will go with a protein shake right before bed. The slow-digesting proteins found in Pro Jym will give you a long and steady supply of amino acids throughout most of the night so your body doesn t eat up as much muscle protein for fuel. The only other time you want fast carbs is right after the workout. Here you want those carbs to not only quickly replenish the carbs you burned during the workout, but you want them to spike insulin levels. The anabolic hormone insulin drives amino acids and carbs (in the form of glucose) into the muscles for recovery and growth, and it also turns on the process of muscle protein synthesis (which is the biochemical steps that lead to muscle growth). So after workouts turn to fast carbs like gummy bears and other fat-free candy, white bread, white potatoes, or sports drinks. The other issue with carbs is timing. You should focus the majority of your carb intake on the earlier parts of the day, like breakfast, lunch and the snacks you have up till the afternoon. When it comes to dinner, you should stick with vegetables as your sides and skip the carby potatoes, rice, breads and pastas. Also keep snacks after dinner to just protein and healthy fats. Speaking of healthy fats, you also need to get in ample amounts of fat, especially healthy fats like olive oil, egg yolks, omega-3 fats from salmon and other fatty fish, and peanut butter. These fats are not as readily stored as body fat as other fats and are readily used for fuel during exercise. On this diet your total daily fat intake will be about 0.5 grams per pound of body weight and about 30% of you total daily calories. Fat is also critical for keeping testosterone levels high. 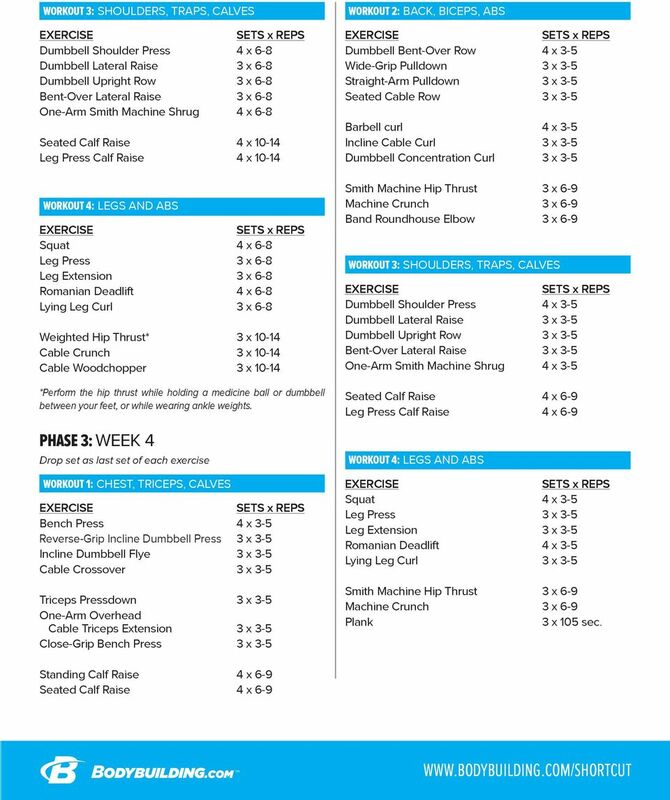 Book end workouts with good nutrition! ** In the beginning it is best to limit your food options. We have provided 3 examples for each meal. You will do best by sticking to this. High Fiber Diet What is fiber? Why does my child need a high fiber diet? How much fiber does my child need? Nutrition Sample Plan 1 MEAL# 1 SNACK 2 SNACK 3 AFTER Workout Nutrition MEAL 3 Whole Omega 3 Eggs (Egglands Best) Lots of Veggies!! Unlimited Greens Celery, Green Peppers, Few Almonds, Cumbers 2-3 oz. Strawberries (8) + Greek yogurt (180 gms) (I use Paris Creek, Honey Bush) + walnuts (8) + chia seeds (1 TSP). 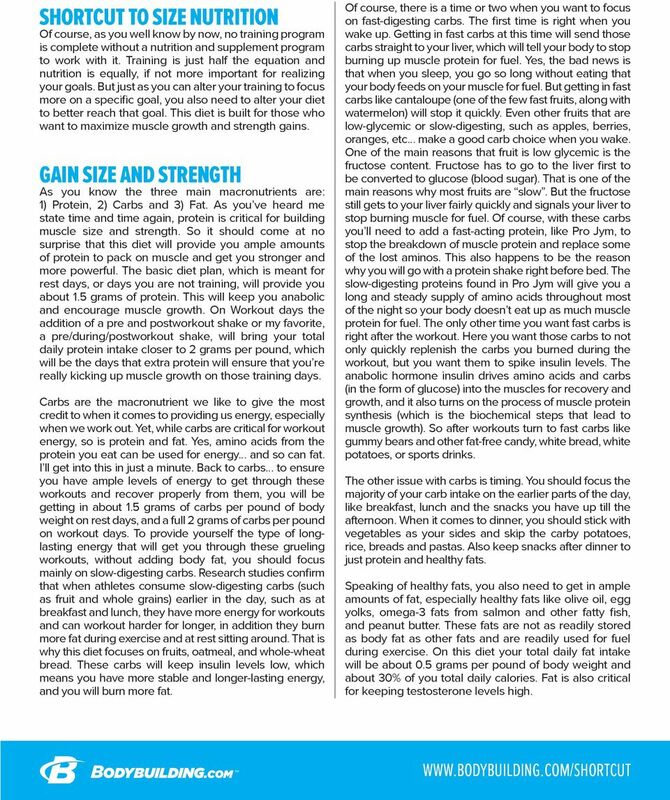 So how much protein do you need if you are a hard training athlete? What are the best sources of protein? Healthy Lunchbox IDEAS It s important to provide a healthy packed lunch for your child to make sure they re getting all the nutrients they need and enough energy to learn, develop and grow and stay healthy. Ham, cheese and egg on an English muffin or a bran muffin? Chicken Caesar salad or grilled chicken on mixed greens?